The hand of God the Father and the dove, God the Holy Spirit, remain near to Jesus as during his Baptism in the Jordan. Jesus died for us and for our salvation in complete, trusting surrender to his Father. The face of Jesus portrays the deep peace of one who, in obedience, has said Yes to the Father. The unusually large hands of Jesus break through the frame of the crucifix, extending salvation toward all God’s people. The body of Jesus reveals his human form, utterly poor and stripped of all. The outer frame of the crucifix, without sharp corners or edges, encloses the mystery of Jesus’ death united to the Father and the Spirit. The arms of Jesus also lovingly take the shape of the crucifix, fill the frame, and break through it, for love breaks every boundary. The ND (Notre Dame, Our Lady) represents our relationship as Sisters of Notre Dame with Mary who entered fully into the paschal mystery. 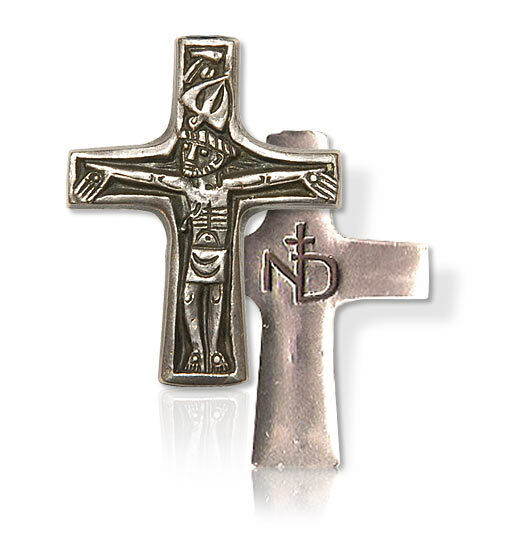 The small cross surmounting the ND represents the reality of our congregation intimately united with Mary in the cross of Jesus. The Crucifix of the Sisters of Notre Dame was designed by Egino Weinert, Cologne, Germany.